J&K Grameen Bank is also participating in the CRP RRB VII for recruitment across various cadres. 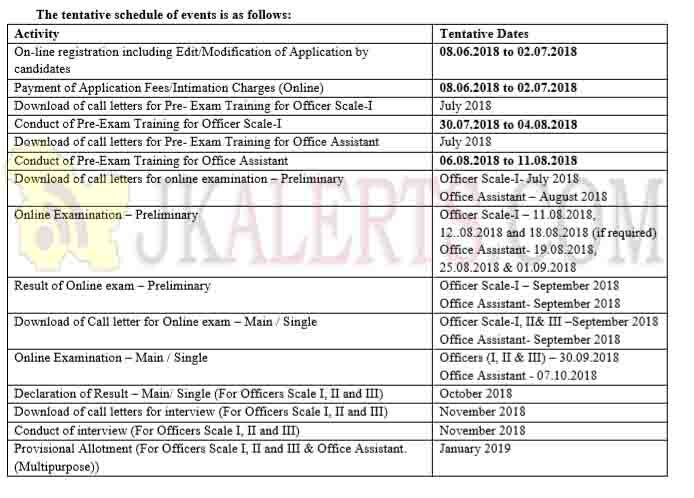 Information regarding tentative posts across various cadres for J&K Grameen Bank and other RRBs is available in the said notification. Institute of Banking Personnel Selection (IBPS) has published notification for the recruitment of CRP RRB VII (Officer Scale I, II, III & Office Asst) vacancies. Those Candidates who are interested in the vacancy details & completed all eligibility criteria can read the Notification & Apply Online. Office Assistant (Multipurpose) Applicants who pass out in their Gradation are eligible to apply for this IBPS Exam 2018. Officer Scale-II Specialist Officers (Manager) Candidates having a graduation degree in one of the following streams: “Electronics / Communication / Computer Science / Information Technology or its equivalent with at least 50% marks in aggregate. Officer Scale-III (Senior Manager) Those who have a Gradation degree with 50% marks can apply for these Government jobs. Candidates are first required to go to the IBPS’s authorised website www.ibps.in and click on the Home Page to open the link “CRP for RRBs” and then click on the appropriate option “CLICK HERE TO APPLY ONLINE FOR CRP- RRBsOFFICERS (Scale-I, II and III)” or “CLICK HERE TO APPLY ONLINE FOR CRP- RRBs- OFFICE ASSISTANT (Multipurpose)” to open up the On-Line Application Form. 2nd July 2018 is the Ending Date for the Online application.